The Men Behind The Medals. 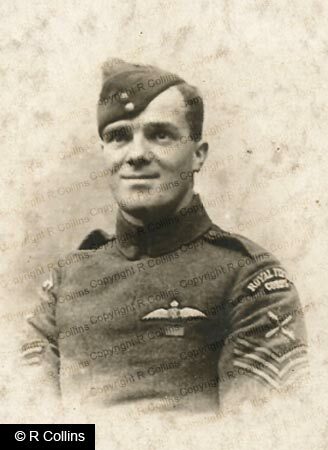 The story of Thomas Mottershead is linked to two other airmen in the Royal Flying Corps, his observers involved in the actions that lead to him being awarded a Victoria Cross and a Distinguished Conduct Medal. This story is incomplete without an account of the lives of these men so inextricably connected to Thomas Mottershead. Thomas Mottershead was born on 17th January, 1892, at 6 Vine Street, Widnes, one of a family of six boys and three girls to Thomas Snr and Lucy Mottershead. His father was employed as a Transport Manager for the United Alkali Company in Widnes. Tom Mottershead was educated at Simms Cross school and later gained a place at the Widnes Technical school. On leaving school he was apprenticed as a fitter and turner at the Widnes Alkali Works and studied engineering in his spare time, gaining a number of certificates. A keen sportsman, he played football for a team in the local league. He was a parishioner of St Paul's church in Widnes and became a Bible Reader. In February, 1914, he married Lillian Bree, a girl from the Tranmere area of Birkenhead and they set up home at 12 Market Street, Widnes. Tom had been working at the Cammel Laird shipyard in Birkenhead and in the summer of that year set off for a new job in the Portsmouth Naval Dockyard. Only days after starting at the dockyard, war was declared and on the 10th August, 1914, he enlisted into the Royal Flying Corps as an air mechanic. Two years later, having applied for and been accepted for pilot training, he had been promoted to Sergeant in April 1916 and in May of that year commenced flying training at the Central Flying school at Upavon in Wiltshire. On 9th June, he obtained his 1st Class Flying Certificate. A month later he was on his way to France and joined the pilots pool at St Omer. Posted to No.25 Squadron at Auchel on 6th July, 1916, he was soon in action in the opening days of the Battle of the Somme. For this action and other displays of gallantry, Sgt Mottershead was awarded the Distinguished Conduct Medal and soon after promoted to Acting Flight Sgt and transferred to No.20 Squadron at Clairmarais, flying FE2ds. He came home on leave at Christmas 1916 to spend it with his wife and young son, Sydney Thomas. Lieutenant Cyril Street was born on the 7th February 1897 at Sowerby Bridge in Yorkshire, but by 1901 the family had moved to Stockport. Cyril's father, Charles, was employed as a clerk in the Lancashire & Yorkshire Bank. At the outbreak of the Great War, Cyril had attended the North Manchester Grammar School and had trained as an electrical engineer at Broadheath. He was living in the village of Gatley, near Stockport as his father has risen to become the manager of the Gatley branch. 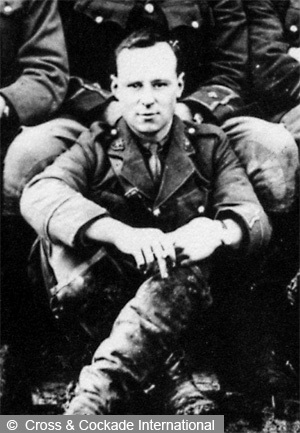 Soon after the war broke out, Cyril obtained a commission as a Second Lieutenant in the Cheshire Regiment and saw active service on the Western Front. In September 1916, he transferred to the Royal Flying Corps as an Flying officer (observer). His first posting to a operational Squadron appears to be 25 Squadron in August 1916. 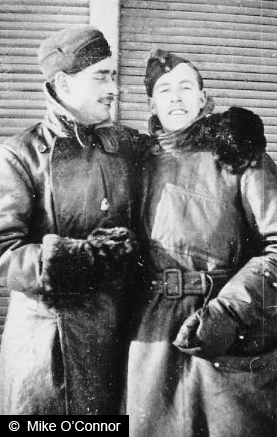 Lieutenant Cyril Street (left) with another pilot. Lt Street later trained as a pilot and gained his Royal Aero Club Certificate on the 27th February 1917 and in April was posted to No.1 Squadron. He was sadly killed in action on the 26th June 1917 in a combat with the enemy. Flying a Nieuport 17 No.B1649, he was attacked by an Albatros fighter, probably flown by Leutnant Karl Allmenroder, Manfred von Richthofen's deputy commander of Jasta 11, (Squadron) who claimed a victory over a Nieuport at 9pm, A fellow officer serving with No.1 squadron wrote to the family "He, with great gallantry, led a formation of our machines in an attack on an enemy formation of five or six machines, two of which were brought down. After the encounter, he was missing, but later in the evening, we had a message to say that he had come down just inside our front lines." Allmenroder was himself killed in action later that same day. The wreckage of the aircraft containing Cyril's body was never recovered and identified and he is commemorated on the Arras Flying Services Memorial to the Missing which commemorates more than 1000 airman who died in France and who have no known grave. Contact Patrol, Sunday 7th January, 1917. Returning to his squadron in France, Flight Sgt Mottershead was soon in action. On the cold and windy morning of Sunday 7th January, 1917, he set off at 11.31 am on a fighting patrol over Ploegsteert Wood with Lt William E. Gower as his observer. They were attacked by an enemy Albatross fighter, thought to have been flown by the German ace Leutnant Walter Göttsch of Jasta 8 (left), who managed to hit Mottershead`s FE2d, serial no. A39, with an accurate burst of machine gun fire which punctured the fuel tank of the aircraft. Within seconds the FE was ablaze. 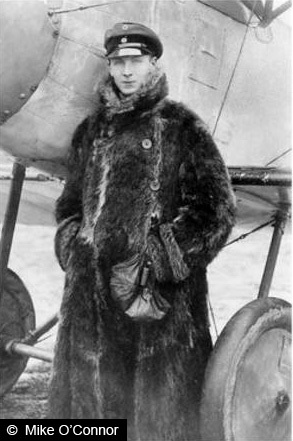 Descending at speed, Lt Gower attempted to fight the fire with a hand fire extinguisher and began spraying his pilot, whose clothing, back and legs were now beginning to burn. Despite the acute pain from his burns, Flt Sgt Mottershead decided to attempt to put the plane down safely in allied territory. Although now engulfed in flames, he managed to turn into the wind and make a landing just behind the British front line trenches. On landing, the already weakened undercarriage collapsed and the nose of the aircraft dug into the soft earth throwing out Lt Gower who was knocked unconscious by the impact. When the plane came to a halt, Flt Sgt Mottershead was trapped in the cockpit of the still burning FE. The crash was witnessed by a working party of troops from the Southern Irish Horse, who managed to free Mottershead from his burning plane. Very badly burned on his back, legs and hands, Sgt Mottershead was still conscious and managed to talk to his rescuers as he was evacuated to the nearest Casualty Clearing Station. During the next four days surgeons fought hard to save Tom Mottershead, but, due to the extent and depth of the burns he had suffered, he finally died on Friday 12th January, 1917 at the No.8 Casualty Clearing Station. Buried the next day with full military honours in the cemetery at Bailleul, every man from his squadron attended to pay their last respects. His Commanding Officer wrote to Mrs Mottershead .... "At the funeral as we lifted the wreath and Union Jack from the coffin and laid them on the ground, we sorrowfully knew that we had laid to rest one of the bravest men who had ever fallen in war..." On 12th February, 1917, in the London Gazette, the award of the Victoria Cross to Flight Sgt Mottershead was announced. Lt W.E. Gower was awarded the Military Cross for his gallantry in same incident. In an open air investiture in Hyde Park, London on 2nd June, 1917, His Majesty the King, George V, presented the Victoria Cross to Mrs Mottershead, remarking that he was sorry he could not have presented the medal to her husband himself. 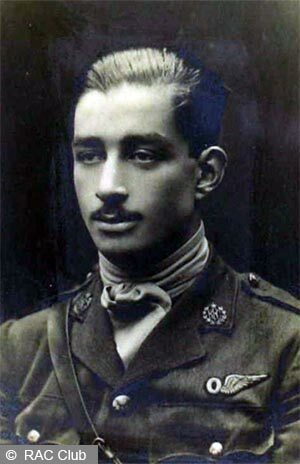 Tom Mottershead is unique in that he was the only non-commissioned flying officer in the Royal Flying Corps or Royal Air Force to be awarded the Victoria Cross in the 1914-18 war. Buried at Ballieul Cemetery Extension, Plot III, Row A, Grave 126. .Commemorated at St Paul's church in Widnes, Cheshire. Lt William Edward Gower was born on 4th April 1891 and in 1909, after attending Derby Grammar School, was employed in the Signals & Telegraphy Office of the Chief Engineers Dept of the Midland Railway Company. His father was a supervisor in the same department. In August 1914, he was living at home with his parents at 62 Arthur Street, Strutt's Park, Derby. With three friends from Derby Grammar, he volunteered for The Old Public School and University Men's Force and shortly after commenced his potential officer's training with the 21st (Service) Battalion of the Royal Fusiliers. On the 16th January 1915, he was commissioned as a Second Lieutenant in the Sherwood Foresters (Notts & Derby) Regiment. Subsequently posted to the 13th Battalion in Yorkshire and later moving to Lostwithiel in Cornwall. After a period of training new recruits, 2nd Lt Gower embarked for France some months later. He arrived at his battalion, very likely the 12th, a Pioneer battalion of the 24th Division, just as they where defending front line trenches in the area of Ploegsteert Wood,(Plugstreet) Belgium. He endured several months of the terrible conditions in the trenches, constant danger and fear, lice, rats and the weather and then decided to apply to join the Royal Flying Corps. 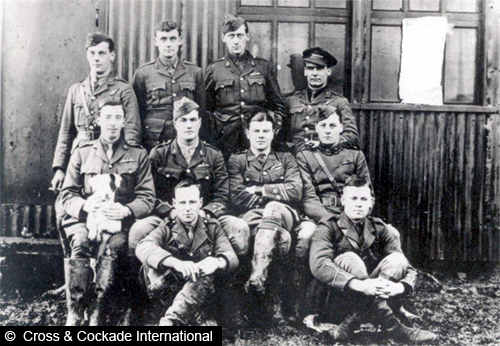 Lt WE Gower (First row left, crossed legs) with other members of 20 Squadron. 20 Squadron, equipped with the FE2d, which Bill Gower describes as an outdated and cumbersome, but immensely strong aircraft, was used in an aerial reconnaissance and artillery co-operation role over their area of the Western Front. His pilot on his first operational patrol was Flight Sgt Thomas Mottershead DCM, who he describes as being,"A man of exceptional technical competence and an excellent pilot and extremely brave" Gower had flown with Flt Sgt Mottershead only twice or three times before the fateful mission on Sunday 7th January 1917. They took off from Clairmarais airfield in another FE2d which proved to be unserviceable and had to return to the airfield to transfer to another airworthy plane. 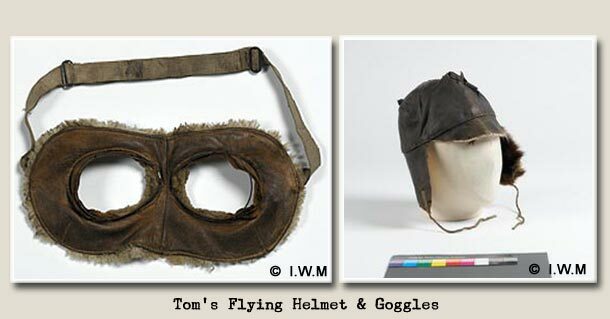 The pair had completed their mission over the trenches and where returning to their home airfield at a height of 10,000 feet, when they where attacked by a lone German Albatros fighter, flown by Vizefeldwebel Walter Göttsch of Jasta 8, (Later killed in action in April 1918) Gottsch approached at a fast speed and was on the tail of the FE2d, he fired immediately as Mottershead simultaneously turned the aircraft to face his opponent. This initial burst of fire hit the petrol tank of the FE2d and ignited the fuel. Seeing the flames, Lt Gower shouted "FIRE" as loud as he could to warn his pilot, Flt Sgt Mottershead immediately responded and put the FE2d into a steep dive as they followed their opponent firing both guns at him as he turned for home. Lt Gower made a frantic attempt, by using his arms and hands, to warn Flt Sgt Mottershead of the danger of the fuel in the auxiliary petrol tank situated under the seat of the pilot catching fire, the signals were to inform Mottershead to turn off the valve to prevent this happening. Flt Sgt Mottershead appeared to understand the frantic signals being passed by Gower and according to Gower, Mottershead actually smiled and nodded as he bent down to turn off the valve. Unfortunately, he was a second too late, as the fuel ignited, flames shot up from underneath his seat, into his face and completely enveloped him. Lt Gower then pulled the fire extinguisher free from its mounting in the cockpit and was able to use it to partially control the flames and attempt to subdue the flames consuming his pilot's clothing. Gower noticed that as he had emptied the extinguisher, he looked down and saw the earth rushing up towards him, luckily Flt Sgt Mottershead saw this too and flattened out just above ground level. Gower remembers nothing more of the impact and the work to recover Flt Sgt Mottershead from his burning and wrecked aircraft. Lt Gower had been thrown clear of the aircraft and was knocked unconscious, suffering other injuries including damage to his right eye. Coming round in an ambulance, next to the very badly burnt Flt Sgt Mottershead, Gower realised that as his pilot was not of commissioned rank, they would go to separate hospitals. An Army Padre travelling in the ambulance took down Mottershead's home address as Gower offered to write to his wife to inform her of what had happened. The crash at 12.15pm, in fields in the area about half a mile from the British front line, to the west of R.E. Farm Cemetery, Wystchaete, had been witnessed by the officers of a Royal artillery Battery close by, their account of this incident is ended with this paragraph: "All the Battery Officers who witnessed the occurrence stated that they cannot praise too highly both pilot and observer, especially the pilot, who must have been in great agony at the time and through his skill in determination certainly saved both lives." Flt Sgt Thomas Mottershead sadly died from his wounds four days later. Lt Bill Gower received a letter from Mrs Mottershead some weeks later informing him that his letter had arrived on the same day that she had received official notification of her husband's death in hospital. Sent to hospital in England to recover from his injuries, he was treated at the London town house of the Duke & Duchess of Rutland. They had converted their house into a hospital for wounded officers. Lt William Gower was awarded a Military Cross for his conduct in the action on the 7th January 1917. At the investiture he was presented with his MC by the King and according to Lt Gower the King asked him to return and accompany Mrs Mottershead as she was presented with her late husband's posthumous Victoria Cross. This he did on the 2nd June 1917. Lt Bill Gower later served in Egypt and Palestine and was granted a Mention in Despatches for his work in Egypt. Discharged from the Royal Air Force in November 1919, he emigrated to Canada with his wife and young son in the 1920's and had a long and successful career in the Canadian stock Market. He passed away in 1985, in Newmarket, Ontario, aged 94 years old. Thanks to Rona Collins, Wendy & Bill Gower*,Norman Roberson (No.20 Squadron Association Historian), The Canadian Expeditionary Force Study Group, Colin Huston & members of Cross & Cockade International, Members of the Great War Forum, John Hartley, Polly O'Connor & Stuart Brown. * "Flying While Dying" An unpublished manuscript written by Bill Gower in 1978/79. Images of SGT Thomas Mottershead VC DCM, are used with the kind permission of Mrs R Collins. or obscure. If any omissions/errors are brought to our attention we will happily amend the website. All images on this website are protected by copyright. The website text is protected by Copyscape. If you wish to use any of the text please contact the Webmaster for permission. Copyright © 2014 The SGT Thomas Mottershead VC DCM Statue appeal. Website designed & developed by IJ-DESIGN.